Add all the remaining ingredients and mix thoroughly. Cover the slow-cooker, set it to LOW and cook on low for 8 to 9 hours. When done cooking, Stir and poke apart the pork to add thickness. (Recipe was successfully tested in an 8 quart Fagor Duo pressure cooker.) Follow pressure cooker directions to bring pressure up to 15 pounds. Cook under steady pressure of 15 pounds for 20 to 30 minutes. Then take pressure cooker off the heat and let cool for about 15 minutes before releasing pressure. 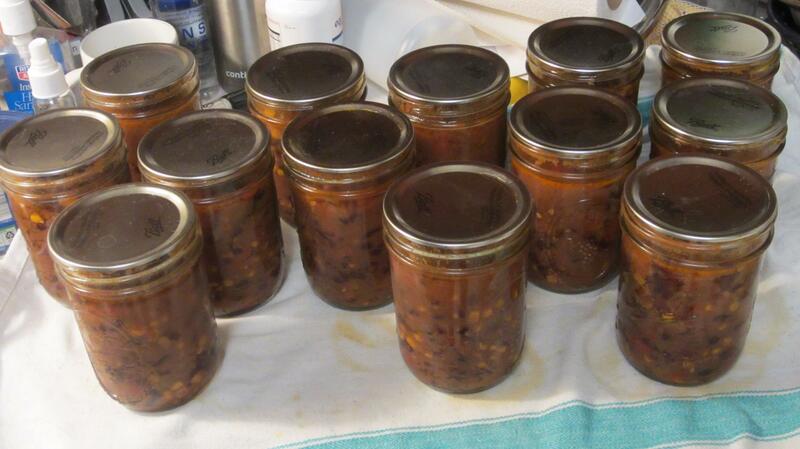 If you are an experience pressure canner; A double batch of Slowpoke Pork Chili will yield enough for twelve to thirteen 1-pint Mason-Jars (and a single 1 pint jar will provide two servings when put together with rice and cheddar cheese...) Simmer a double batch in a stew-pot long enough to cook though the meat (don't bother poking apart the pork - just cut up smaller chunks). Fill & prepare the jars for pressure canning, then follow best pressure canning procedures for 90 minutes at 15 pounds. Measure out 45 grams (1.6 ounces) of dry rice per serving and cook in boiling water for 15 minutes. Cover each serving of rice with one-half-pint of chili in medium soup bowl. Cover and microwave each serving on high for about two minutes (it won't take long if the rice is already hot). Then put on a topping of shredded cheddar cheese as desired to taste. Hot and delicious! This recipe works well with a 6 quart slow-cooker. It also works well in an 8 quart stainless steel pressure cooker.